opendorse wouldn’t be where we are today without the athletes, brands and events that paved the way for the sports endorsement industry. We thought it would be fitting to take a look back at the history of athlete endorsements and pay homage to some of the pioneers of the sports endorsement industry. Wagner is considered one of the finest all around players in baseball history, and to some, the greatest shortstop in baseball history. Wagner was the first professional athlete to receive endorsement money for allowing the use of his name on a product. He was also the first professional athlete to make an endorsement deal with a sporting goods manufacturer, Louisville Slugger. Wagner began his career playing with the Louisville Colonels in Louisville, Kentucky. There, he befriended Bud Hillerich, who in 1894 had begun producing baseball bats with the name Louisville Slugger engraved on them. Many ball players began to use Hillerich’s bats, who also engraved their names on the bats so they could tell which bat was theirs. One of those players was Wagner. In 1900, Wagner left Louisville to play for Pittsburgh. In 1900, 1903 and 1904 he was the National League Batting Champion. All the while, Wagner and Hillerich stayed in touch. The following year in 1905, Wagner signed a contract with Hillerich which allowed Louisville Slugger to use Wagner’s signature on baseball bats sold in stores. Thus, making Wagner the first professional athlete to receive endorsement money by allowing the use of his name on a product for sale. Today over 60 percent of major leaguers use Louisville Slugger bats. Wagner is also notorious for his American Tobacco issued baseball card. In September 2007, a rare Wagner trading card sold at auction for $2.8 million, then a record price. The Wagner card is one of 524 baseball cards that were issued by American Tobacco between 1909 and 1911. American Tobacco was using baseball players to promote its cigarette brands by packaging the cards inside cigarette packs. On the reverse side of the Wagner card is a Piedmont cigarette advertisement. 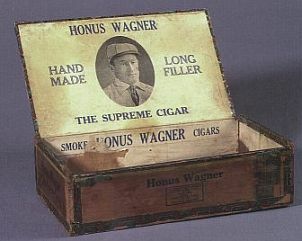 The Wagner cards became a rarity because once Wagner discovered American Tobacco had issued his card without his permission, Wagner stopped their production. However, his exact reasoning for doing so remains unclear. Some say Wagner wanted an endorsement fee from American Tobacco. Wagner’s granddaughters claim that although he did chew tobacco, the real reason he halted production is because he didn’t want children buying cigarettes in order to get his card. Regardless of the reason, those events helped shape terms of mutual agreement between athletes and brands. Wagner’s endorsing career didn’t end there, he went on to appear in endorsements for gum, gunpowder, soft drinks, Gillette razor blades and ironically enough, cigars. In 1922, pro golfer Gene Sarazen became the first member of the Wilson Advisory Staff and his contract with Wilson Sporting Goods lasted for 75 years! The deal became the longest running endorsement deal in the history of sports. A plane ride inspired Sarazen to design a club that would “glide through the sand.” Sarazen debuted his sand wedge club at the 1932 British Open, which he won. This marked the introduction of the sand wedge and the “explosion” shot was born. That year Wilson sold more than 50,000 R-90 clubs, the most popular sand wedge in golf. Sarazen was the pioneer of lengthy endorsement deals. He paved the way for current long-term athlete endorsers like David Beckham, for example, who signed a lifetime agreement with Adidas. It may come as a surprise to today’s generation that the first million dollar sports endorsement was not offered to a football, basketball, baseball or soccer player; but, however, was earned by a professional bowler. Although bowling may not currently be a high profile sport , back in the 1950’s and 60’s, bowling was a popular American hobby that allowed people to go out and interact with one another. At the time, there was no better bowler than Don Carter, who was voted Bowler of the Year six times (1953, 1954, 1957, 1958, 1960 and 1962). In 1964, bowling manufacturer Ebonite capitalized on Carter’s fame and bowling’s popularity by signing him to the first million dollar sports endorsement deal. Carter’s Ebonite deal launched the widely popular Don Carter Gyro-Balanced ball. Since then, the amount of dollars spent on sports endorsements have continued to grow substantially. Just ask Rose, McIlory or Beckham, current owners of the largest athlete endorsement deals. Babe Didrikson Zaharias was the epitome of an athlete. She was an All-American basketball player, two-time Olympic gold medalist in track and field and co-founder of the LPGA where she won 14 consecutive tournaments, a record which still stands today. She emerged as the first female athlete of the 20th century to fully leverage her notoriety and marketability. Babe won gold medals in the 100 meter hurdles and javelin, as well as silver in the high jump at the 1932 Olympics in Los Angeles. After the Olympics, she became so visible that when she bought a Dodge, the company placed an ad in the February 1, 1933 edition of The Chicago Daily News, showing her praising the car’s benefits. Unfortunately, Didrikson competed at the amateur level which disallowed her from endorsing. The Amateur Athletic Union suspended her, without a hearing, from amateur competitions. Didrikson was reinstated as an amateur, but she turned pro shortly afterward making her free to endorse. Chrysler quickly signed her to promote Dodge Coupes at the Detroit Auto Show. 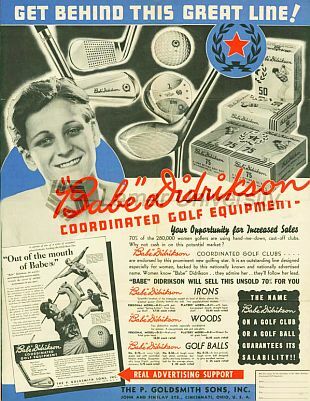 Didrikson also teamed up with brands like with Wheaties and sporting goods company P. Goldsmith Sons in 1935. Her endorsements set the stage for some of today’s highest paid female athletes like Maria Sharapova, Serena Williams and Danica Patrick. In 2000, Sports Illustrated named her second on its list of 100 Greatest Female Athletes of All-Time. That’s only half of the history. Look for Part Two, coming to you next Monday, November 25th. Meanwhile, now is a great time to sign up for free with opendorse so your brand can create a monumental endorsement with the help of an athlete.